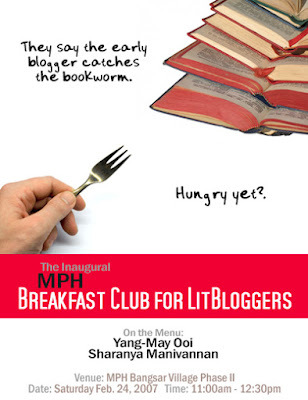 Ted Mahsun: The Inaugural MPH Breakfast Club for LitBloggers. And I must say, it does look hunkier and dorier! Open to everyone, especially if you have a blog. I hope they've got scones there. Been ages since I've had scones for breakfast. See ya there! is that what reading too much murakami does for you? Haha! If so, I'll be having spaghetti for breakfast! You know, I've never had any Bowie associations with the phrase until you mentioned it. How weird. Not too weird, Ted. Bowie released a cult-classic album titled Hunky Dory, of which my favourite song is Life on Mars. Or was your question rhetorical? Ted...where's the cute cow? I love the cow. What say...you donate the rights to use the cow on my website. I'm in love with it.